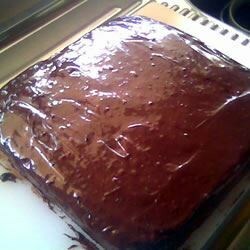 "This is a wonderful eggless cake recipe, moist and absolutely delicious. Not only that, it hardly takes any time to prepare. It's something I got from my aunt, and whip up in a jiffy. I hope you love it too!" Preheat the oven to 350 degrees F (175 degrees C). Butter and dust with flour a 10 inch bundt tin. Cream the butter or margarine till light and fluffy. Beat in the condensed milk. Combine the flour, cocoa powder, baking powder, and baking soda; mix into the creamed mixture alternately with the cola. Bake for 45 minutes, or until the cake tests done. Very strange ingredients, but it all came together vey well. Tasted like the chocolate part of a devil dog. It needs some kind of frosting, or to be topped with ice cream. This cake had a strong cocoa flavor, which my husband really liked. I prefer a more chocolate flavor. I also found it a bit dry, but not overly so.